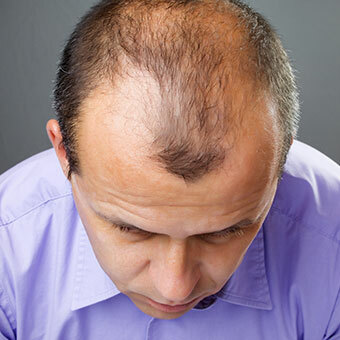 The majority of male or female patients generally suffer from stress related scalp flaking and not dandruff. 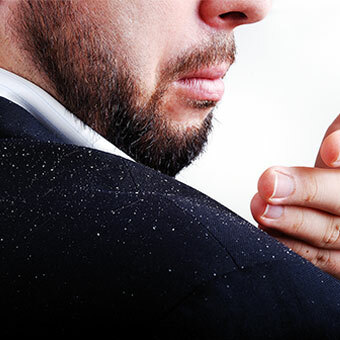 However, whether dandruff is involved or not, the symptoms are both uncomfortable and unsightly. It is important to understand that we all shed skin cells constantly from all over our bodies and the scalp is no exception to this. Your skin is constantly renewing itself and dead cells from the scalp fall away as new skin cells form beneath them. 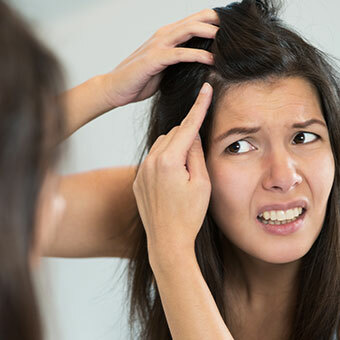 Many people suffering scalp flaking, whether associated with irritation or not, often think the cause is a dry scalp and stop shampooing their hair. To stop shampooing the hair and scalp will inevitably create more severe problems, since a dirty scalp will create even more flaking and irritation, leading to an increase in harmful bacteria. The problem most often encountered with dandruff shampoos is that they are far too stripping and high in chemical content. This leads to further problems, because as flaking and scalp debris are removed, the layer of sensitive new skin is damaged by the harsh ingredients, causing it to dry out, irritate and flake away. You are then in a constant cycle of irritation and flaking. This clinic recommends Profol Scalp Clear Treatment Shampoo. This amazing treatment will not strip the delicate acid mantle from your hair or scalp. It will settle and soothe your scalp irritation whilst removing excess scalp flaking. Profol Scalp Clear Treatment Shampoo is for all scalp types. This formula is designed for daily use. You can of course email us with any queries you may have, by using the ‘contact us’ link. Profol Scalp Clear Treatment Shampoo will control the itching very quickly. Due to its extreme mildness, Profol Scalp Clear Treatment Shampoo is extremely successful in treating a huge range of scalp problems. It is formulated with TEA Laurel Sulphate which is a very mild and expensive surfactant. It also contains a very low dosage of the active ingredient, PIROCTONE OLAMINE. Shampoo daily with Profol Scalp Clear Treatment Shampoo for the first week or so or until your scalp problem clears. Then every other day for around two weeks and if no problems occur, then go to every third day, or twice weekly, which is the maximum you should leave it between shampoos. However, from my own personal experience the more often you shampoo with Profol Scalp Clear Treatment Shampoo, the better the results will be. Once the problem is under control it is advised that you continue to use Profol Scalp Clear Treatment Shampoo as your regular shampoo. Shampoo daily with Profol Scalp Clear Treatment Shampoo for the first week or so or until your scalp problem clears. Then every other day for around two weeks and if no problems occur, then go to every third day, or twice weekly, which is the maximum you should leave it between shampoos. However, from my own personal experience the more often you shampoo with Profol Scalp Clear Treatment Shampoo, the better the results will be. Once the problem is under control it is advised that you continue to use Profol Scalp Clear Treatment Shampoo as your regular shampoo. With regard to the hair thinning problem I would recommend Profol Advanced Formula Hi-Potency Lotion spray which can be applied daily, morning and night. It is not sticky so does not need to be rinsed out. After application the scalp often reddens and feels warm and tingly this is normal whilst the blood supply is being boosted to the hair follicles. This will last for up to 20 minutes. Within approximately three weeks your hair loss will have slowed to normal levels and the problem will not get any worse with continued use of the spray. Many clients report new hair growth within 12 months whilst many take much longer, therefore a sensible patient approach to treatment is advised. Profol Advanced Formula Hi-Potency Shampoo can be used daily but should be used at least once weekly to prevent the build-up of sebum plugs. After application the scalp often reddens and feels warm and tingly this is normal whilst the blood supply is being boosted to the hair follicles. This will last for up to 20 minutes. The shampoo can be used daily on its own as the only treatment. However, for a more potent effect we recommend the use of the lotion spray at the opposite end of the day, therefore boosting the blood supply to the hair follicles for a second time. 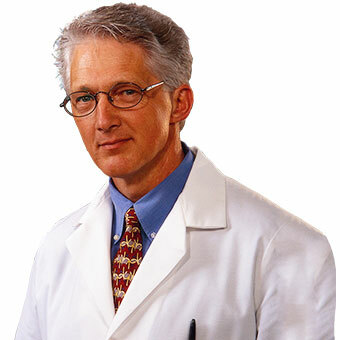 Within approximately three weeks your hair loss will have slowed to normal levels and the problem will not get any worse with continued use of the Profol Treatments. Many clients report new hair growth within 12 months whilst many take much longer, therefore a sensible patient approach to treatment is advised. Profol Advanced Formula Hi-Potency Lotion spray. The Lotion Spray should be applied daily, morning and night between shampoos. It is not sticky so does not need to be rinsed out. After application the scalp often reddens and feels warm and tingly this is normal whilst the blood supply is being boosted to the hair follicles. This will last for up to 20 minutes. 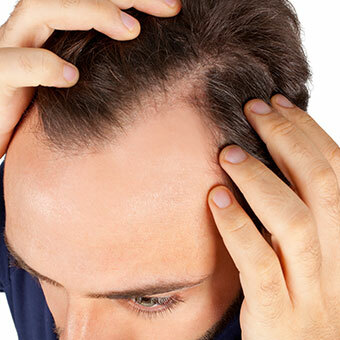 Within approximately three weeks your hair loss will have slowed to normal levels and the problem will not get any worse with continued use of the Profol Treatments. Many clients report new hair growth within 12 months whilst many take much longer, therefore a sensible patient approach to treatment is advised. In today’s world your hair needs maximum protection from harsh elements such as winter wind and rain. The harmful and damaging effects of U.V. sunlight have never been greater, due to climate change. Your hair is a complex network of keratin bonds. In dry or damaged hair, these bonds are often damaged or missing and in fine and thinning hair, they can be weak and fragile. The problem people encounter with most conditioners is that they are heavy and greasy, leaving the hair coated and lifeless. The last thing healthy hair needs is to be encompassed in hard wax as if it was the wick of a candle. We have addressed that problem with Profol Pro-Active Conditioner. Formulated with protein, sunscreen and De-Panthenol, it will leave your hair moisture rich with body, volume and shine. Profol Pro-Active Conditioning Treatment is tomorrow’s conditioner today.